Virgin's Richard Branson Does GM In NYC? Anyone know why the General's doing a press conference in NYC right now with Virgin Atlantic's Richard Branson? We've got someone there who's got a few quick camera phone shots for us — but even he's unsure what it's all about. All we've been able to glean from searching with Google our sources is it's some sort of environmental initiative between the two companies. We've included that AP brief in all it's brevity below the jump. What we've determined, AP notwithstanding, is Branson's new fleet of 787's will get Rolls-Royce Trent 1000 engines. Yes, those are the 75,000 lb thrust models. What does this have to do with GM? Well — something to do with fuel cells. We'll have more as it develops. 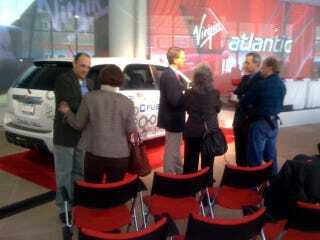 UPDATE: It's all one big PR stunt — Virgin will use the Chevy Equinox Fuel Cell Car as their VIP car at LAX. It's all about reducing our carbon footprint. Lame. We were totally hoping Branson was buying GM. As commenter graverobber put it, "Virgin Vauxhall any one?" Virgin Atlantic Airways Richard Branson and General Motors (nyse: GM - news - people ) CEO Steve Ridgway announce environmental initiative.